King will leave a void that will be difficult to fill. So we have come to this day, after all. 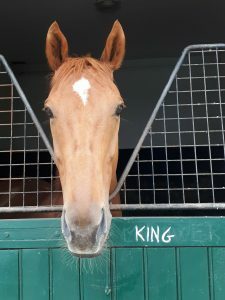 King Driver (Domedriver and Queenmara out of King Of Clubs) has been officially retired, and the yard has an empty space that is far bigger than King’s box. King has been our standard-bearer for nearly nine years. He leaves us with six wins and 25 places from 55 starts, and many, many memories, both wonderful and challenging. I didn’t train him, he trained me. 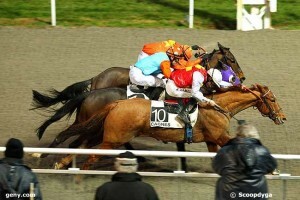 King Driver at the 2010 Osarus yearling sales at La Teste. 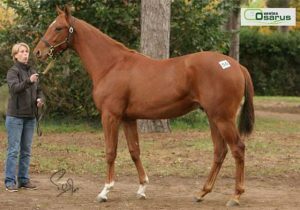 He was the first (and still only) yearling an owner trusted me to buy at the sales. He taught me about tapeworms, flat feet, pirouettes, broken bones (and how you could discover them years after the fact), the importance of jockey choice (he just simply refused to move when he disagreed), how to load a horse in the truck (one large German with a huge yell will do the trick), how to spot ghosts (but still, only he could see them), gelding (don’t wait, just do it), but mostly how an incredibly beautiful chestnut with an eight-meter stride length and a heart that no one could match can glide to the finish line first when all the stars align. We will miss you very much, King.